You have a hot idea on a new unique TLD? Let us help you turn the idea into reality! RegistryASP has over 8 years experience in development and operation of advanced Registry and Registrar solutions, serving Registries and Registrars around the world. 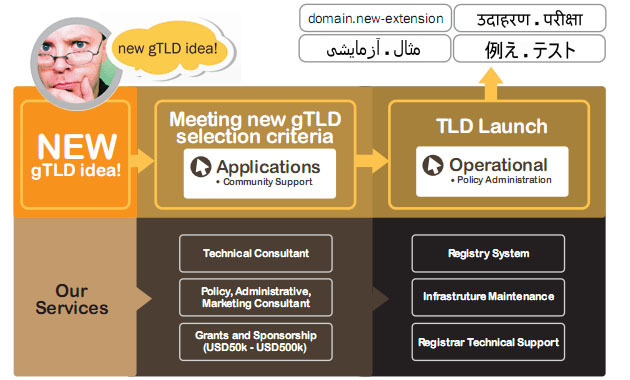 RegistryASP is well prepared to assist you to bid and run your new gTLD venture! We are very flexible in catering to any business rules or design requirements, no matter how complex they may be. Provide technical framework documentation and infrastructure that is cost effective and exceeds evaluation criteria. Proven experience preparing IDN.IDN fast track. We operate the registry system with daily health checks, preventive maintenances and round-the-clock monitoring of all hardware and software faults.